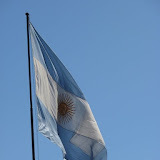 Photos : Argentina Part I | Follow us ! Lovely photos. Do not be afraid to get in front of the camera Karim ;-) If it was Shuchuan, she would be in them all! :-) And get more together! Best of luck. You lucky things!